Mark was born in Sitka, Alaska, a sublime but wet locale under the North Star. When younger, Mark wanted to be an astronaut. As a result, he started drawing pictures of outer space and flying saucers-soon including monsters and creatures in the illustrations. His appetite to draw grew as the years went by, but it wasn't until Mark was in Junior High School that he decided to pursue a career in art. After high school, Mark went to college at Gonzaga University in Spokane, Washington, to expand and hone his artistic talents. While there he took many classes outside of art because they provided information about a variety of subjects and helped Mark come up with ideas. In particular, he liked science courses. Following Gonzaga, Mark went on to receive his master's degree in fine arts at Washington University in St. Louis, Missouri. He then packed his bags and joined his friend Anson to work in Seattle. 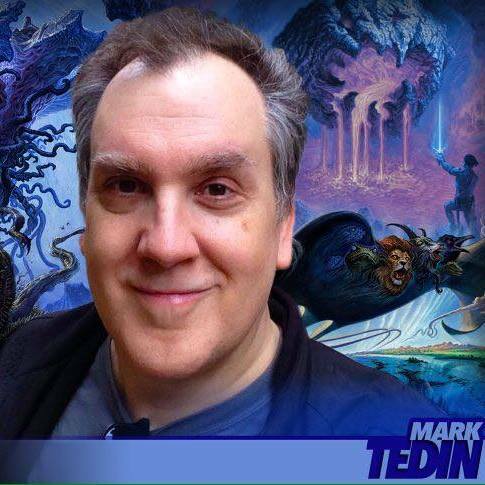 Mark's freelance work for Wizards of the Coast began shortly after he arrived in the Emerald City. For him it was, and still is, a dream come true: drawing strange creatures and environments and making a living at it! From 1997 - 2000, Mark also worked on site at Wizards of the Coast as a staff conceptual artist. Until 2016, he'd also been teaching illustration, visual composition, and figure drawing part-time at the Northwest College of Art and Design (now located in Tacoma, WA). Mark has been freelancing illustrative and conceptual design work for twenty five years and is loving it.